Grows to 100 feet with a broad, open crown of almost equal spread. Foliage consists of compound leaves 12 to 24 inches long and leaflets 2 to 5 inches long. Grows best in deep, rich, moist soil. Large, rich, flavorful nuts are not the only aspect of value for this tree. It is one of the most highly valued of North American hardwoods for cabinets and furniture. 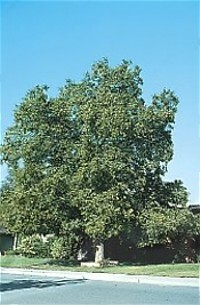 For best nut production, space 30 feet apart to develop full, well branched top. For timber use, space 8 feet apart for fastest, straightest growth. Should start producing nuts in 8 to 10 years. Plant at least two for pollination. No shipments to AZ, CA, MN, NM, TX.